Cool, mid 20s, still, clear. Yesterday [March 20, 2014] was a major day for photo achievement, the first of what I hope will be many. As I wrote at my office (in a neighborhood McDonalds with free wireless because my home does not have it) the phone rang: Bill Wylie Kellerman, the pastor of St Peter’s Episcopal Church in Corktown. He invited me to a tour he would give about the Rivera Ford Motor Company mural at the Detroit Institute of Arts (DIA), same day, 1 pm. He’d written about the mural in the context of Detroit, “Reading Rivera, Resurrection and Remembering in Post Industrial Detroit,” a fine article. Perfect. I struggled to arrive on time by car-bike. Having pioneered mall lot parking a few days earlier I didn’t bother searching for parking near the DIA but headed straight for the mall where I’d parked on another day, and used the same exact parking spot. On my folding bike I huffed to arrive at the DIA on time, 1 pm, to find no one there for the tour. Wrong day? Eventually Bill showed up, only Bill, no one else. He nervously fingered his beard. Where are the others? he rhetorically asked me, I would have canceled this if I’d known no one but you would show up. I need the time to rehearse a story I will tell at the African-American museum on Friday. As he made some phone calls, I looked at the suits of armor in the hall adjacent to the Rivera mural, thinking, this is a curious juxtaposition, men of war with a mural of relative peace. Eventually about 8 people showed up, mostly or all from Christ Episcopal Church. A range of people, ages, skin color, interest level. All seemed to have at least a modicum of knowledge about the mural, some much more. Bill began by asking us to examine the mural and notice one thing, a technique I often use in my teaching. I observed bodies, the range of arms and faces. On the north panel men worked together, many with uplifted elbows, nearly all their faces were visible. On the south panel, the opposite—men did not labor with such obvious strain and Rivera had revealed few faces. Others in the group noticed colors, placement, symbolism, etc. Bill suggested the layout of the main walls referred to the classic arrangement of cathedral walls: east as birth, west as judgment, and I’m not sure what if anything he said about the north and south walls. Using my big Nikon for the first time on this trip I photographed and videoed the tour, relatively happy with results. Surely I saw much more during and after the tour, thanks to Bill. I bought a second collection of mural postcards, this one to give to other friends helping me with this project. Before we parted I raised the question of photographing the Rouge River as a way to depict Detroit. No one had heard of such a project. Most exclaimed surprise and confusion about the extent of the river, how widespread it was, where it might be actually red (rouge), if anywhere. I continue to believe this might be a useful approach to Detroit. Maybe today I’ll examine the Rouge where it enters the Detroit River. As Bill pointed out, the only completed automobile is at the vanishing point of this image, the little red object. After the tour I lingered awhile longer in the museum, studying the rest of the armor exhibit, marveling at what humans will perpetuate to settle their differences, medieval Europe with its Christian iconography, a few other halls randomly selected, and the museum space itself that I find bewildering. 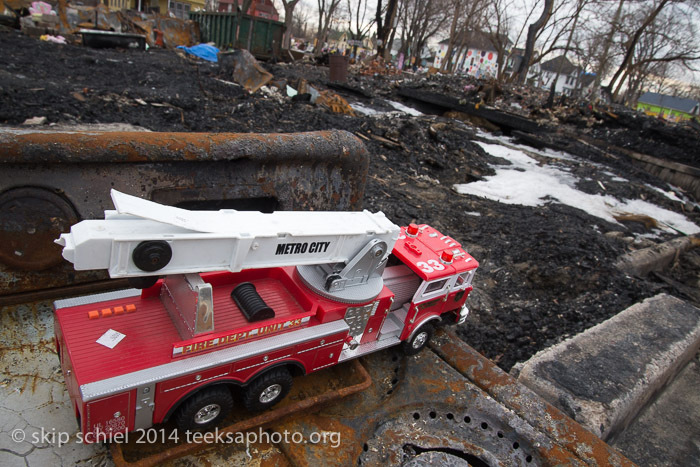 Then, related and in contrast, the Heidelberg Project, which has suffered something like 8 arsons since last spring. Bicycling up I noticed a man sitting in a pickup truck, then the same man raking debris from the roadside. This was Tyree Guyton, the founder and director of the project. Long suffering community and city resistance, his project is now at much greater risk. Who is destroying it and why? After photographing some of the wreckage—much remains and probably is not subject to fire, such as the installations not attached to houses—I approached him and asked, are you Tyree? I am so sorry about what is happening here, I hope to show others thru my photography. I introduced myself after he’d asked who I was and then I stated, whoever is burning this project is probably insane. I disagree, he said, not insane. Do you mean strategic? I asked. I refuse to speculate, he wisely replied, I will simply move on. This reminded me of the Leverett Peace Pagoda folks after their first temple burned. No, sorry, no photos please. Thanking him, wishing him and the art well, I bicycled further, to continue my photography and video from my bike—2 passes on Heidelberg St. A carload of young women, perhaps university students, also photographed. One seemed to know Tyree. Between exploring the Rivera mural and the Heidelberg Project, in the midst of many vacant lots, old buildings, some of them elegant and well maintained, others crumbling, side-by-side—2 museums, 2 uses of art, sharing much—I photographed an elderly housing complex in the midst of vacant land. Name of the complex? Paradise Valley. Well, I really love this presentation, Skip. I’m seeing the power of the Rivera mural as never before. Your focus on elements of it, like Henry Ford himself with hardworking laborers and vast, impersonal machines in the background bring to life the essence of the mural–the huge difference in life experience between the wily, clever, relentless entrepreneur and the workers who end up gaining jobs but giving their very lives to implement his dream. The mural overall is magnif, but overwhelming and busy for the mind to digest. Your focused rays bring it home. 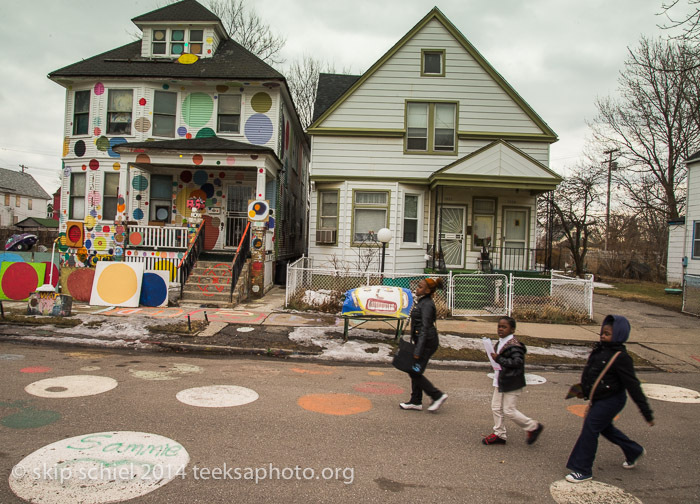 I’m so apart from Detroit, sadly, that I don’t know about the Heidelberg Project or Tyree and the painted clock images. Hope you’ll tell a few more details about these evocative mysteries.